Updated on Tuesday, Oct. 27, at 3 a.m. ET. The USS Lassen has sailed within 12 nautical miles of the contested Spratly Islands in the South China Sea. 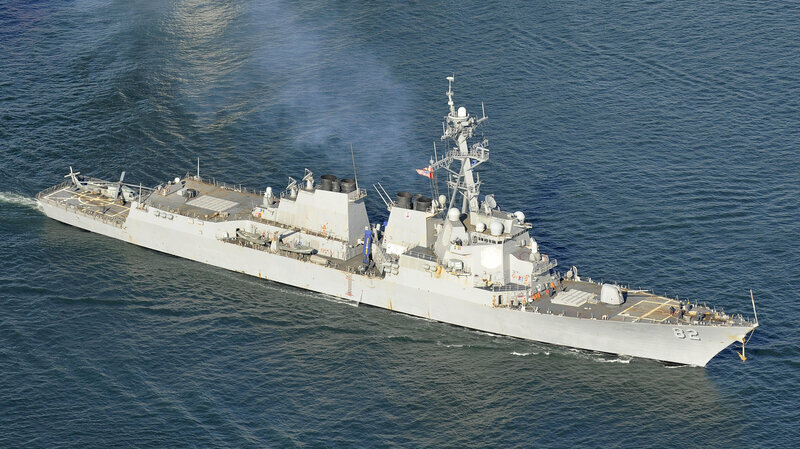 The Pentagon says the guided missile destroyer passed by the Subi Reef on Tuesday morning local time, NPR&apos;s Anthony Kuhn reports. The move, which the Obama administration has billed as exercising the right to freely navigate international waters, is being characterized as a challenge to China&apos;s claim of control over the area. "Make no mistake, the United States will fly, sail and operate wherever international law allows, as we do around the world, and the South China Sea is not and will not be an exception," Defense Secretary Ash Carter said on Oct. 13, according to The Associated Press. The Spratly Islands are a collection of hundreds of islands and reefs. In the past year, China has staked out territory in the area, constructing seven man-made islands by piling sand on top of some of the reefs. China&apos;s claim of sovereignty in those waters, along with its rapid construction of the artificial islands, has heightened tensions in the region. Complete with runways and docks, the new islands pose a threat to the Philippines, Vietnam and other East Asian countries, which also claim some of the islands. China&apos;s territorial claim has also created problems in U.S. and China relations. The U.S. has long maintained that it is free to sail among the Spratly Islands. "The whole point of freedom of navigation in international waters is that it&apos;s international waters. You don&apos;t need to consult with anybody. That&apos;s the idea," State Department spokesman John Kirby said, according to the AP. The U.S. presence is a tangible indication of its position that the area is not under Chinese sovereignty. A Chinese official, however, chastised the move, saying the U.S. was "flexing its muscles." "Freedom of navigation and overflight should not be used as excuse to flex muscle and undermine other countries&apos; sovereignty and security," a spokesman at the Chinese embassy told the AP. "We urge the United States to refrain from saying or doing anything provocative and act responsibly in maintaining regional peace and stability."